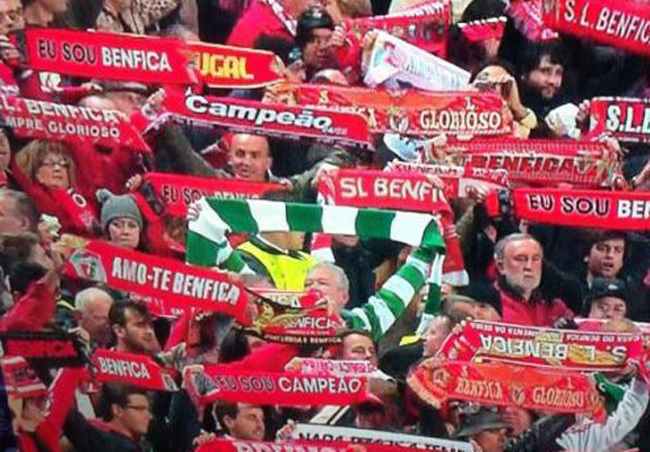 He may have watched his beloved Bhoys fail to build on that famous win against Barcelona, as Celtic went down 2-1 away at Benfica, but for one brave and proud Celtic fan, he wasn’t going to be put off by a few thousand locals. Well, either he was brave, or he’d simply got lost and ended up in the wrong end of the ground. Surely this would make a decent “Should’ve gone to Specsavers” ad? As for Celtic’s hopes of making it to the knockout stages, they are currently level on seven points with Benfica, with leaders Barca already qualified courtesy of their 12-point haul. While the Portuguese giants have to face Messi & co on the last day, Neil Lennon’s men host Spartak Moscow. Exciting times for the Hoops!